This is the first of a two-part (part II here) series of my experiences (and impressions) using an Intel NUC ( a 4th generation model) for various things about cloud, virtual, physical and software defined server storage I/O networking. The NUC has been around new for a few years and continues to evolve and recently I bought my first one (e.g. a 4th generation model) to join some other servers that I have. My reason for getting a NUC is to use it as a simple low-power platform to run different software on including bare-metal OS, hypervisors, cloud, virtual and software defined server storage and networking applications on that might otherwise be on an old laptop or mini-tower. For those not familiar, NUC is a series of products from Intel called Next Unit Computing that offer an alternative to traditional mini-desktop or even laptop and notebooks. There are several different NUC models available including the newer 5th generation models (click here to see various models and generations). The NUCs are simple, small units of computing with an Intel processor and room for your choice of memory, persistent storage (e.g. Hard Disk Drive (HDD) or flash Solid State Device (SSD), networking, video, audio and other peripheral device attachment. software (not supplied) is defined by what you choose to use such as a Windows or *nix operating system, VMware ESXi, Microsoft Hyper-V, KVM or Xen hypervisor, or some other applications. The base NUC package includes front and rear-side ports for attaching various devices. In terms of functionality, think of a laptop without a keyboard or video screen, or in terms of a small head-less (e.g. no monitor) mini-tower desktop workstation PC. If you need to be the first with anything new, then jump direct to the recently released 5th generation models. On the other hand, if you are looking for a bargain, there are some good deals on 4th generation or older. likewise depending on your processor speed and features needed along with available budget, those criteria and others will direct you to a specific NUC model. I went with a 4th generation NUC realizing that the newer models were just around the corner as I figured could always get another (e.g. create a NUC cluster) newer model when needed. In addition I also wanted a model that had enough performance to last a few years of use and the flexibility to be reconfigured as needed. My choice was a model D54250WYK priced around $352 USD via Amazon (prices may vary by different venues). Whats included with a NUC? My first NUC is a model D54250WYK (e.g. BOXD54250WYKH1 ) that you can view the specific speeds and feeds here at the Intel site along with ordering info here at Amazon (or your other preferred venue). 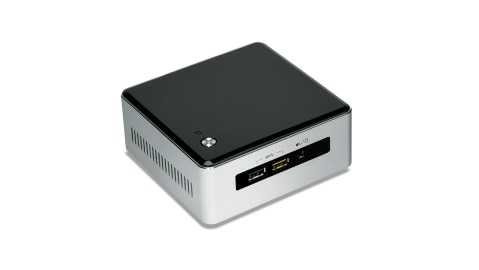 View and compare other NUC models at the Intel NUC site here. The following images show the front-side two USB 3.0 ports along with head-phone (or speaker) and microphone jacks. Looking at the rear-side of the NUC there are a couple of air vents, power connector port (external power supply), mini-display and HDMI video port, GbE LAN, and two USB 3.0 ports. There are various Intel Core i3 and i5 processors available depending on specific NUC model, such as my 54250WYK has a two core (1.3Ghz each) 4th generation i5-4250U (click here to see Intel speeds and feeds) which includes Intel Visual BIOS, Turbo Boost, Rapid Start and virtualization support among other features. Note that features vary by processor type, along with other software, firmware or BIOS updates. While the 1.3Ghz two core (e.g. max 2.6Ghz) is not as robust as faster quad (or more) cores running at 3.0Ghz (or faster), for most applications including as a first virtual lab or storage sand box among other uses, it will be fast enough or comparable to a lower-mid range laptop capabilities. In general I like the NUC so much that I bought one (model 54250) and would consider adding another in the future for somethings, however also see the need to continue using my other compute servers for different workloads. This wraps up part I of this two-part series and what this means is that I like the idea of a Intel NUC I bought one. Continue reading in part-two here where I cover the options that I added to my NUC, initial configuration, deployment, use and additional impressions. Ok, nuff said for now, check out part-two here.